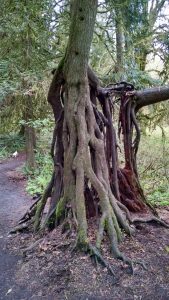 I have always loved the cycle of the forest and how the ancients elders life as a tree ends just as it’s new life for support begins. I have started photographing the amazing start for so many trees in the forest from nurse stumps. Here is one of my favorite hard wired beginning for this leggy individualist in a local park.